# The day unfolds and so does the banner! # …and the Hotel board too…Hotel was full that day! Needless to say who increased occupancy to 100%. #Ajai Banerji nears the end of of his presentation on the Non government railways of 1964. Note that the starter signal is at Caution to signify the time limit. #PVS Praveen has a question. # Dr. Sanghi is relaxed and enjoying his snack. Next year, same time, he will be busy with CNB 2008. #Road number king ”Koochukchuk” Krishnan with Arnab Acharya. #The Quiz Final was in Brindavan Express livery! # Sridhar Joshi…the man behind MAS 2007 takes the teams into another round of questioning. The finals of Build your train Quiz saw four teams pitched against each other. They were Apurva Bahadur and Dr. Jitendra Mulky, PVS Praeen and Mohan Bhuyan, Sivaramakrishnan and Biswarup Basu and Shashank Nanda and Sagar Tipnis. The Quiz consisted of 6 rounds. First four rounds: Each team giving the right answer straight or passed question, get 5 coaches each. At the end of Second Round, teh team with lowest score was eliminated. Same again at the end of round 4. Round 5 was a written round…Teams were to earn sops from Railway Budget for their train. Both remaining teams had to write down the answers of 5 questions asked. If both got the answers right, they got 5 points. If one answered correct and the other wrong, the correct answered earned 10 points for that question and the wrong answer gets no points. Round 6 was the loco round…time to earn locos for the train built. The questions were also based on locos. Two questions to each team. One on Diesel and other on Electric. Electric Question had a visual! No written round this time and questions could be passed. The end of Round 4, we had Shashank Nanda and Sagar Tipnis as one team and Apurva Bahadur and Jitendra Mulky as the other team. Apurva and Jitendra finally won the quiz. ROUND 1: Start Collecting Coaches S1 to S3 and 2 SLR. Identify the author (IRFCA) of this trip report. # History! In 1863, what section was formally inaugurated within the GIPR by Sir Bartle Frere, the then Governor of Bombay? # What, until recently, was common to Miraj, New Jalpaiguri and Yelahanka? Round 2: Earn S4 – S8 Uneconomical trains shall be withdrawn . #In 1886, W. Newman & Co published the first ________________ . Fill the blank. 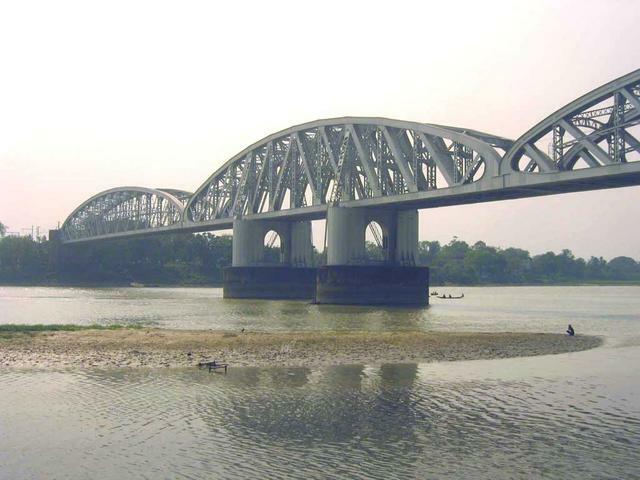 #Identify this railway bridge and the river. #IR has classified permanent way based on Maximum Permissible Speed allowed like A, B, C and so on. What classification was given to MG tracks with permitted speed above 75 kmph? # In 1956, an accident at the bridge on river Marudayar led to the resignation of the then Railway Minister, Lal Bahadur Shastri. In 1987, the same bridge was blasted by TNLA activists, derailing the Rockfort Express that killed 25. Name the station nearest to this bridge. # Why is this small kid driving the suburban train? # What kind of rolling stock is equipped with the Scharfberg couplers? # Which station was the border checkpoint for Pondicherry when it was under French rule? What specific action does it signify? # Fill the blank: The _________ is a point to the rear of a converging junction, such that a train must be to the rear of that point in order to ensure that any train moving on the other converging line can proceed without being obstructed. # Which is the only divisional headquarters with “Road” in its name? Identify the edifice being described in this old news article from The Hindu. # What, in 1925 replaced the B.E.S.A ( British Engineering Standards Association) with respect to standard for designs and classification of locomotives? MDU, TPJ, TPTY, GTL, NED, OM, NMH, FL, DLI? # What would be the class of locos for Road Numbers beginning 11001? # What would be the current class of loco for Road Numbers beginning 15501? 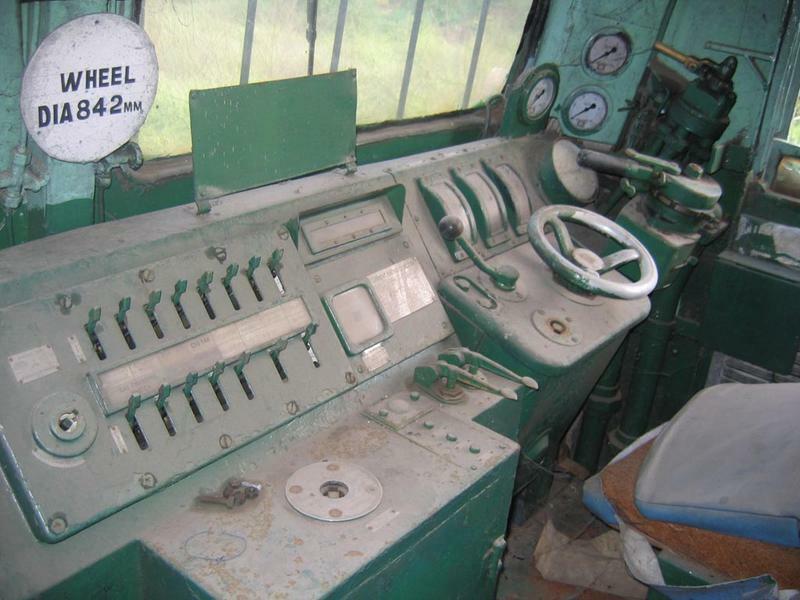 #Identify this loco class from the shot of the cab seen here. #What is common to all these electric locomotives? 4. They all had all the three gauges prevalant in IR: Broad , Netre and Narrow. 2. CNN IBN’s SMS code and TN Express number are 2622 and Aaj Tak and Dibrugharh Rajdhani’s numbers are 2424. 3. 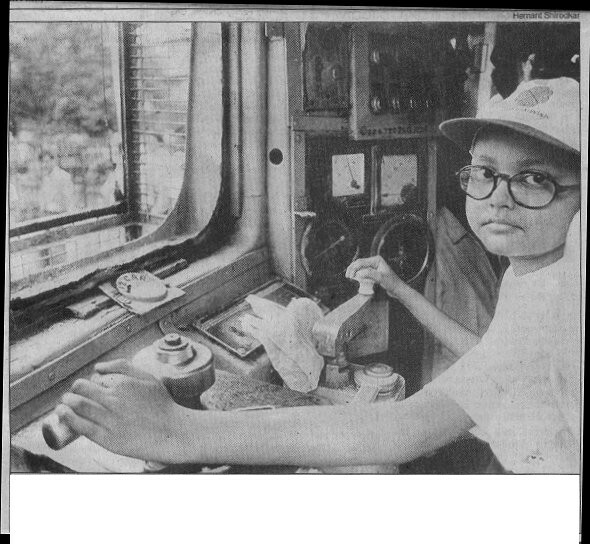 Animesh Gorai from Bihar was allowed in the motorman’s compartment as a part of the Make A Wish Foundation’s programme which helps terminally ill children. 4. They were all named after national leaders: Babasaheb, Jagjivan Ram, Jawahar, Vallabh and Bidhan in the order L-R of the photographs. Poor connectivity forced us to hold blogging the remaining porgram. # Closure of MAS 2007 and exchange of bonhomies. Mr. Poddar made an excellent presentation, which could be easily be the highlight of the Convention. He took us through the restoration process of the PSMR (the Ewing mono rail system) and how difficult it was to find information about it even in Patiala. 100 years ago the station of Patiala was located in a jungle! Today it is a part of the patiala town with the PWD store. A few rusted remnants of the Patiala State Mono Rail were found buried in sand at the PWD store. In those days it conected the towns of Bassi and Sirhind and later Sirhind to Alampura and Patiala to Bhawanigarh. The trains were pulled by mules maintained by the army of Patiala . Later, in 1909 Orstein and Koppel provided the four uniques steam locos that were based on the Ewing mono rail system. The PSMR was withdrawn due to poor partonage and dwindling finances. Itfaced stiff competition from other modes of transport, especially bullock carts whose drivers were vehemently opposed to this system. It closed in 1927. For the 2008 Convention, Mumbai makes a bid too…but I guess it is between NDLS and CNB. 1. What is common to these routes (list is not exhaustive)? 2. The _______ Railway company was established in 1845, (later succeded by a new company which started work in 1853)? 4. 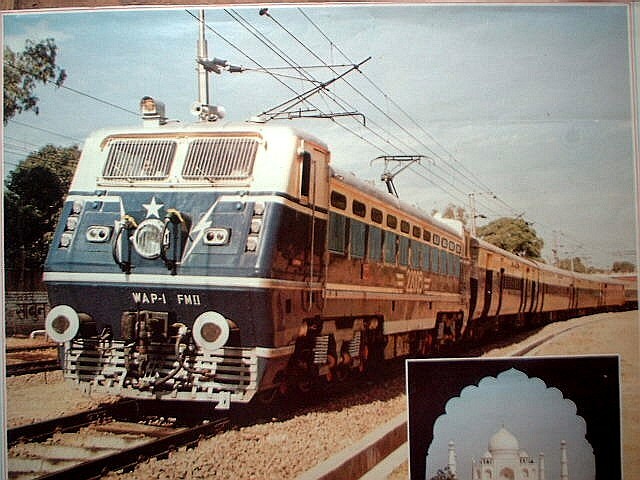 What was the origin and destinatio nof the very first Shatabdi express introduced in 1988? 5. Name the station situated between Munabao in India and Khokrophar in Pakistan. 6. 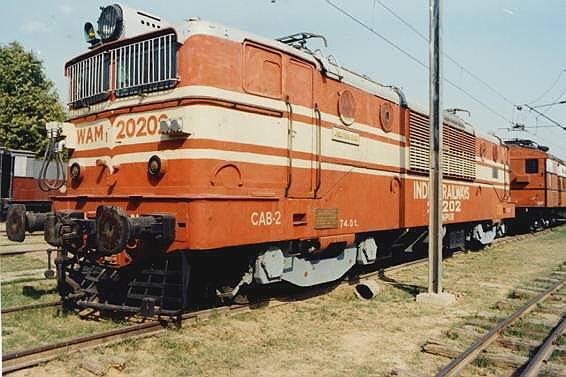 Identify the locomotive from this picture? 7. 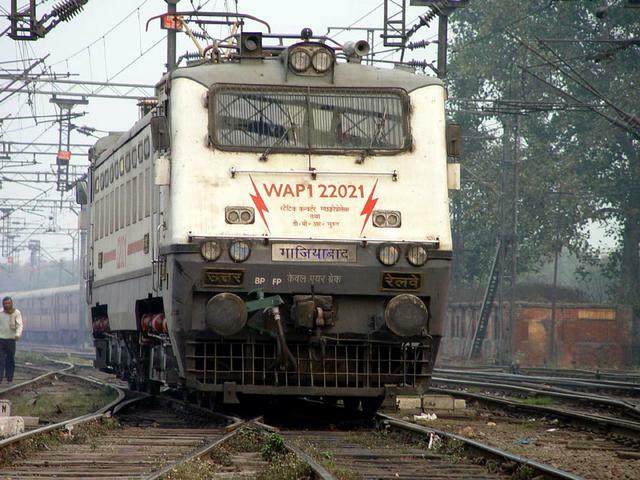 This indian state was formed only in 2000, but had a train named after it more than 20 years ago… which state? 8. The practise of using the locality name for a railsway station exists in variouslocal communicities. If Nampally is for Hyderabad, which station is in a area called Kalupur? 9. What was the earlier name of the Guru Teg Bahadur Nagar railway station? 10. 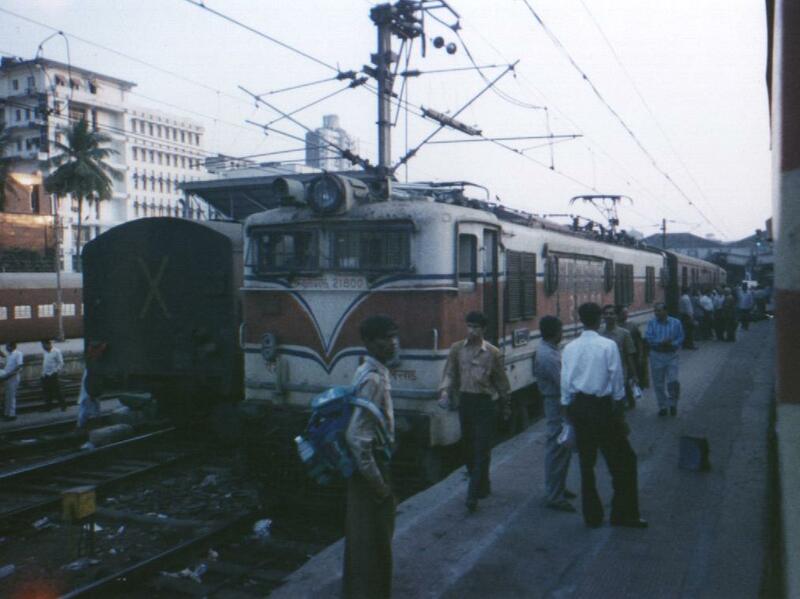 Identify the train service from this modified picture? 11. Which ministry does the Commisioner of Railway Safety report to? 12. There are manu stations suffixed “Cantonment”.. But which is the only one fto be suffixed “Barracks”? NMot “Barrackpore”! 14. Brevity! What is this? 15. What would a train cbe carrying if it has all wagons classified as VVN? 16. SLR coaches are being slowly phased out of productions in favour of SLR-D coaches. What does D stand for? 17. Delhi Main station holds the record for the largest RRI system, commissioned in a record 44 hours. Which company completed the changeover to the new system? 18. Which zone of the IR manages the Kolkata Metro Railway network? 19. What major decision was implemented by the then Railways Minister Nitish Kumar, effective from World Environment Day on June 4, 1999, though the statement of this intend was made in the Budget earlier that year? 20. Identify the shed from this logo/……. 21. Which is the only station in IR to have the word “Station” in its name? 22. Until recently, this train had the max. 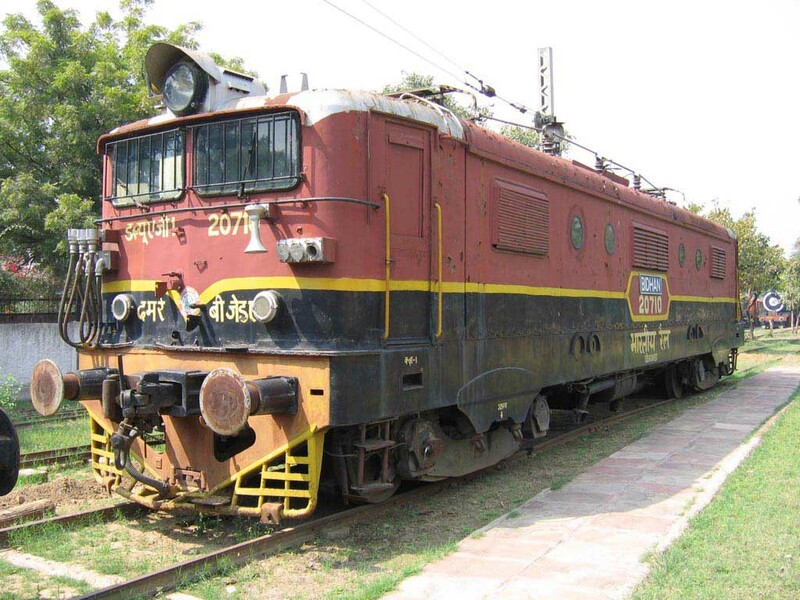 no of loco changes… It’s changes were – Diesel > Electric > Diesel > Electric > Diesel.. What is this train? 23. What does the following signal indicate? 25. One IRFCA Member was instrumental in getting TKD Shed to name a particular class of locomotive. Whoz the person and what was the class of that locomotive? 1. They are the routes in the respective zonal timetables tabled as No. 1. 18. None. Kolkata Metro Corporation manages it. Shanx is pitching for Delhi, 19 and 20 of january. NRM, Metro, all round super connectivity to anywhere in India, day trips galore, Asaoti and Dadri, Agra Shatabdi, all kinds of locos, etc. IIT kanpur campus itself is by the railway line…no need to travel far. Kanpur people want to do it in a family sway…sposes and kids included. Convention hall has 200 seats. Feb 2, 2008 is proposed date. We decided to have a detour here…. We have the pitches for the Next Year Convention…bids for hosting.